What can you expect in Zagreb? 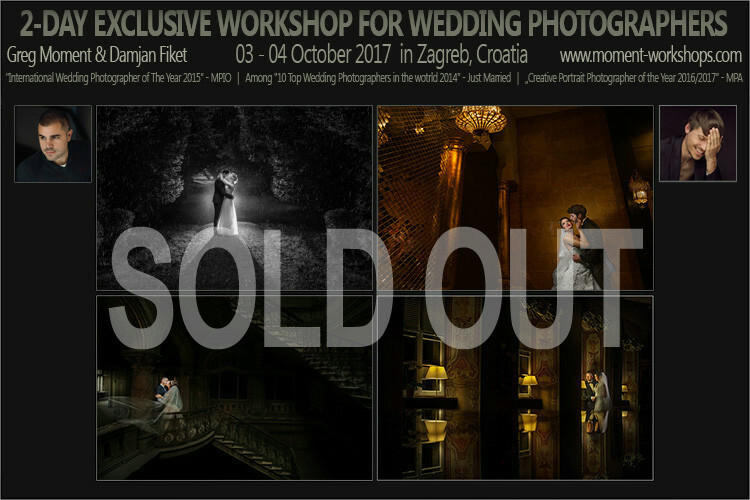 This time Greg Moment (www.moment.com.pl) provides two-day-long workshops for wedding photographers in Zagreb, Croatia together with Damjan Fiket. Damjan Fiket is an international awarded wedding photographer from Croatia. As a wedding photographer he has travelled to many destinations such as USA, UK,Germany, France, Austria, Switzerland and Italy... He won several Gold and Silver Awards at SWPP in the UK. He also won the "Wedding photographer of the year” competition in a Photojournalistic Category in 2014. At WPPI he has won several Silver Awards and Awards of Excellence from 2009 till now. In 2016 he became a member of Phottix Pro Team (an Ambassador for Croatia. ► You will see how Greg Moment and Damjan Fiket create vision and style in Photoshop at the end. The workshop starts in the centre of Zagreb. The location will be provided soon. Group: 15 photographers. Way of payment: PAYPAL or contact us to find the most convenient way of payment for you. Early birds: 250 EUR !!! (paid before 10.09.2017.). 100 EUR deposit is required to reserve a seat.